Rachel | How Can I Keep From Singing? Sometime in late 1999 I joined an online pregnancy board of moms due in June 2000. A good number of us have stayed in touch over the years. They have always been supportive of all that I have gone through with Nathan. A few years ago one of them (Kat) even moved to Colorado Springs for a while so I got to know her well “in real life” and then she had to move away. Kat’s Junebug Rachel is such a sweetie. Kat and family came to visit us once in the hospital and Rachel climbed right on the bed to play with Nathan. She didn’t even seem to notice the bald head and IVs, or else it didn’t seem to bother her. She was there to play, and they did. Around the time that they moved away again they started to have issues with Rachel. It was a wide variety of problems to unspecific to pinpoint. Very recently Rachel lost a good portion of her vision. 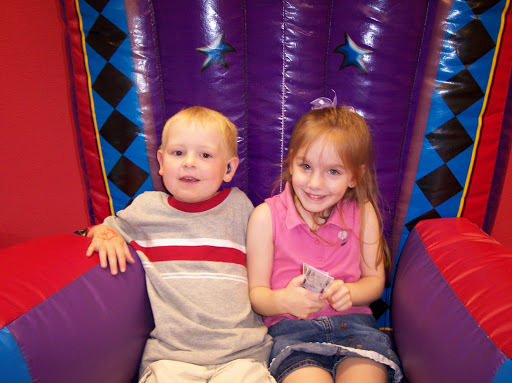 This led to months of testing which has led to a devastating diagnosis, Batten Disease. It is a fatal degenerative disorder of the nervous system. I am so horrified that this has happened to Rachel and to Kat and her family. I thought I had the market cornered on kids with terminal illnesses from our small group of women. For some reason I still feel that Nathan’s cancer and death should exempt his peers from similar fates. I know the world doesn’t work like that but somehow it seems like it should. Kat’s main goal is to treat Rachel’s symptoms the best she can and to keep Rachel from knowing her fate. Some may not agree, but I agree 100% on that. Rachel should be able to have the happiest, fullest, life she can live with the hand she has been dealt. Her job is to be a kid. The road ahead is long and scary for Kat and her family. Please send some prayers her way. How terribly sad. I will keep her in my thoughts and prayers. What a horrible disease. I will definitely pray for them. It makes you hug your kids tighter. I've thought about you and Kat more and more recently. It's just horrible what's happened to both of you and your sweet kids! I am so glad you posted that, Susan. I have been struggling with the "not fair" for both of you.